A Will, or Last Will and Testament, allows you to name a person or persons to manage your estate in the event of your death and provides instructions for the disposition and transfer of your property to only those persons or entities named in the Will. In the event you were to die without a Will or other suitable estate plan, your property would pass to your relatives through a statutory scheme known as intestate succession. A Last Will and Testament is only one of many different estate planning tools available to you. Your Last Will and Testament can work hand-in-hand with other estate planing instruments, such as revocable and irrevocable trusts, charitable trusts, and special needs trusts. 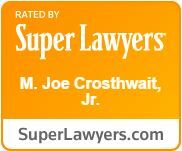 At The Crosthwait Law Firm we understand that there is no one-size-fits-all estate plan, and we will advise you of all the options and personally see to it that your estate plan is individually tailored to your unique needs and goals.